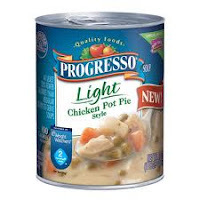 Check out these brand new flavorful light cream soups from Progresso! Soup is definetly a staple in our household, especially during this time of year. When the weather gets cold we all start reaching for a nice hot bowl of soup. These soups have also come in handy since we just had a new baby... these are not only easy to make (for all our busy nights), but they are soo soo good and satisfying! We have been getting pretty bored with the regular chicken noodle and minestrone soups, plus some of the other flavors are packed with calories. It's so refreshing to know that Progresso has come out with two new amazing soup flavors and they are light! They are Light Creamy Potato with Bacon and Cheese and Light Chicken Pot Pie Style. Both of these new flavors are a big hit at my house and such great traditional flavors. They are hearty, flavorful and they are light so I don't feel guilty serving these to my family. 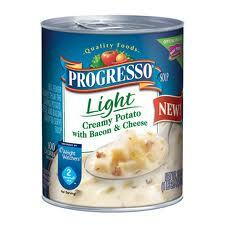 Check out Progresso's new Light soup flavors today... you won't be disappointed! Also, check out Progresso on Facebook! "Disclosure: The information, products and ProgressOh! gift packs were provided by Progresso through MyBlogSpark."